Saisyu Kusanagi (草薙 柴舟) is the previous head of the Kusanagi clan and the father of KOF's main character Kyo Kusanagi. 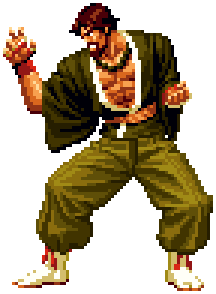 Saisyu Kusanagi debuted in The King of Fighters '94 as a victim in Rugal Bernstein's gallery of defeated fighters. He appears as a mid-boss in The King of Fighters '95 and becomes a regular playable for the first time in The King of Fighters '98. He was the previous head of the Kusanagi clan who left his family to face worthy opponents across the globe. After his defeat by Rugal, he was brainwashed by his secretaries (primarily by Vice) to fight his son, Kyo. Upon his defeat, he regains his senses and escapes from the ship, Sky Noah, unnoticed. Saisyu then leaves the clan's duties to his son, presumably resuming his travels. This page was last edited on 27 January 2009, at 21:52.